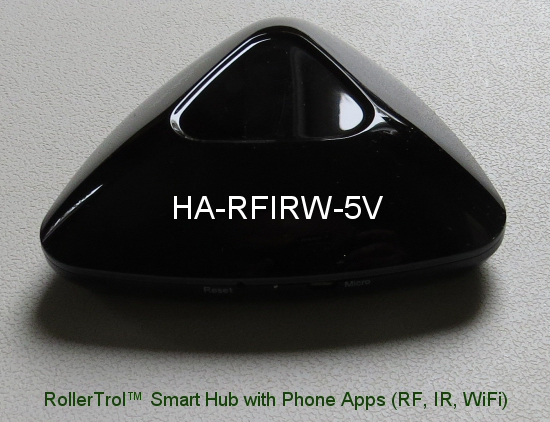 If you need a simple phone app to control your smart home, the RF-IR blaster hub from BroadLink® has quickly become our hub of choice for a number of reasons. It is one of the first controllers that can "learn" RF radio commands. May controllers can store IR commands that are typically used for TV and audio system control, but this is the first of its kind to learn RF remote control codes. So it can directly control our radio motors, whether they are our new G series radio motors or the older R series motors. It also has timers too. It can also control our window and skylight openers, our smart film, our drapery motors, and many other devices, such as fans, LED lighting, etc. It can also learn x10 radio commands, if you have a few of those modules. 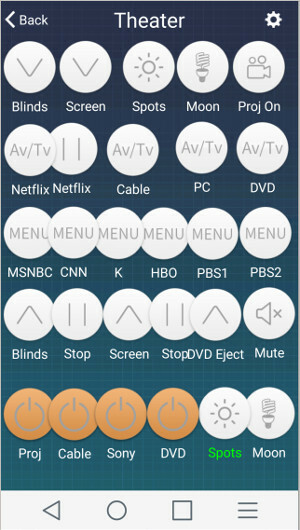 The Android and IOS phone apps are easy to use, and it's a really good way to put your old tablets and phones to use as home automation controllers. You can create a screen with button controls for your various systems quite quickly. Once that is done, you can clone that screen to any other phone or tablet on the local network. You can also upload it to the cloud to support family or clients in remote locations. You can also extend operation to your laptop or PC by using software that puts your phone screen onto your laptop or PC, using mouse clicks to simulate button presses. We use the Seven Square program to display our Android phone screens on our Ubuntu laptops via USB connection to the phone. There are similar programs for Windows, Mac, and IOS. It also has companion products for detecting environmental conditions such as temperature, humidity, air quality, smoke detectors, etc. There are also has security accessories for detecting motion, window and door opening, and other events that are security issues. ou can purchase these products in our DIY online automation store.